"How a TV argument led to David Duval’s new leadership role with Team USA"
Good read here from Golf World’s Dave Shedloski on how David Duval is trading in his pancake for a cart this week at the Ryder Cup. Good news, his IFB will come in handy for the Vice Captain channel this week in France. Duval’s late addition to the vast coaching squad stems from his on-air debate with Brandel Chamblee during the 2016 Ryder Cup. Chamblee questioned the effectiveness and play of Tiger Woods and Phil Mickelson, and Captain Davis Love’s players took heart back at the team hotel. Also worth a chuckle is Shedloski’s review of Duval’s place in Ryder Cup history as one of the players wanting to see some form of compensation for players. He calls it an initiative now. Let's forget that the PGA of America is bringing the Ryder Cup back to Hazeltine National just a dozen years after it last hosted, or that the course in question isn't particularly memorable, lovable or likely to be pursued by other organizations for a championship. 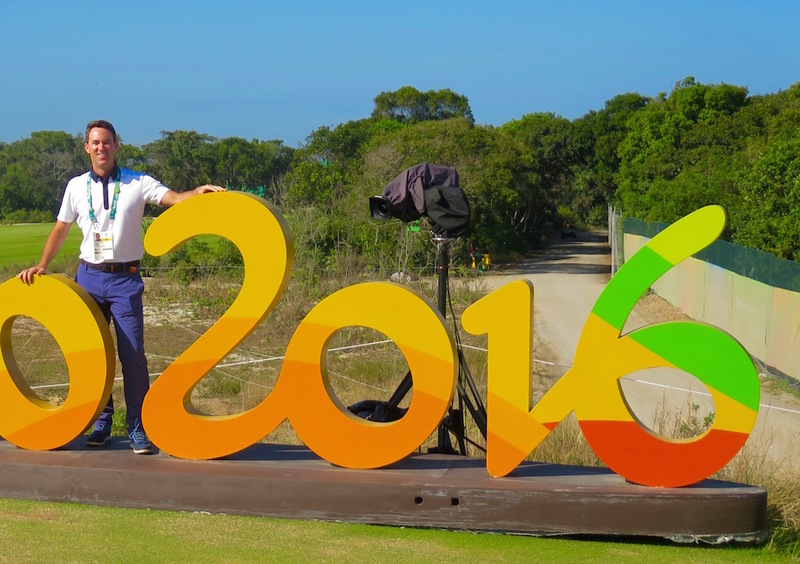 The course was beautifully conditioned and in its defense, tainted by Team USA's dreadful Sunday singles placement of nearly all hole locations in the green centers. Hazeltine -- site of the U.S. Ryder Cup Team’s 17-11 victory in 2016 -- will become the first American venue to host a second Ryder Cup. Four English courses have hosted multiple Ryder Cups: The Belfry (1985, ’89, ‘93, 2002); Royal Lytham & St. Annes Golf Club (1961, ‘77); Royal Birkdale Golf Club (1965, ’69) and Southport and Ainsdale Golf Club (1933, ’37). So let's ask as we always do with these silly announcements: why lock in venues that aren't in demand so far down the line? What is the incentive? Because the news value tends to range from "who cares" to "I just hope to be alive in 2028", instead of, "boy I can't wait!" Paddy Calls The Calls To Change Ryder Cup Criteria "Silly"
Ted Bishop's Unfriended opens like a media crisis thriller, but ultimately is worth reading because of the gentle way the former PGA of America president shows how golf's five families work and takes you behind the scenes of Tom Watson's Ryder Cup captaincy. While serving as a golf tell-all that only genuinely exposes a few PGA of America officers as short-sighted given the absurdity of his offense, the book never makes you want to run for the shower. In fact, it's often hard to put down thanks to Bishop's brisk, breezy style that only occasionally slows down. The book documents Bishop's extraordinarily productive two years as PGA President, which saw the organization's profile raised and the membership defended by Bishop. Things have flat-lined since with the PGA and it's little wonder that the downward trend coincides with Bishop's removal with 28-days to go. Ted answers a few questions via email below. You can buy Unfriended here at Amazon that includes a Kindle edition, or should you support non-Amazon retailers and want a signed copy from Ted, visit this page. Also, Ted recently joined us on ShackHouse pre-Ryder Cup. Here is The Ringer's page for the show. GS: What was your goal in writing this book? TB: My departure as the President of the PGA of America is unprecedented and historic. Political correctness has taken on a life of its own with the 2016 Presidential election and it makes my impeachment look even more bizarre. Unfriended was simply an opportunity for me to tell my side of the story with no filters from anyone, including the media. It was also a chance for me to share some of the great stories and memories that I have been privileged to be part of in golf. GS: Did the PGA Of America attempt to stop the book from being published? TB: The PGA made it difficult to write and publish my book. Ultimately, I had to seek the services of Levine, Koch, Sullivan & Schulz, one of the top First Amendment firms in the U.S. My lawyers determined that I had not violated any of my confidentiality or fiduciary duties to the PGA. That allowed me to press on with the book. I was fortunate that Classics of Golf publishing stuck with me through the PGA threats. In the end, I allowed the PGA to preview the book before it was published. In my opinion, that validates the integrity of the content in Unfriended. GS: What’s the feedback been like since you published? TB: People tell me the book is extremely interesting, entertaining and easy to read. They enjoy being "inside the ropes" on things such as the Ryder Cup plus getting to know the biggest names in golf like Tom Watson, Arnold Palmer, Tim Finchem, Donald Trump, Phil Mickelson and Tiger Woods. Golfweek said that the book "raises the curtain on the insular world of those who rule the game and offers rare insights." But, I would also say that the politics in golf have worked against Unfriended to some degree. There is no question that certain media outlets won't touch the book because they don't want to get sideways with the PGA of America. That's too bad because the book does not reflect poorly on the PGA. People need to give Unfriended a chance. I suppose the title might have given some readers the wrong impression about the book's message, but Unfriended is a pretty fitting way to describe what happened to me. GS: The book opens as a firsthand account of how not to handle a modern media crisis, which you openly share. Was this a bit of therapeutic writing or your effort to help someone down the road in a similar situation? TB: It was definitely therapeutic to a degree, but the first couple of chapters were also very painful for me because I had to relive the events when I wrote about my departure. You are absolutely correct about helping other people out. Unfriended is far more than a golf book. It's a case study on corporate media relations, political correctness and social media usage. I would like to use the book as a spring board to speak at the corporate level about the responsibilities of leadership in the 21st Century. There are many valuable lessons that I can share and they are very interesting given the people that I associated with in golf. GS: The account of the 2014 Ryder Cup is particularly interesting and puts the U.S. performance in good perspective. You also detail the beginnings of the Task Force concept, but now in hindsight you think it was unnecessary? TB: The Ryder Cup Task Force was absolutely necessary. We had to change our approach and it obviously paid off with a U.S. victory this year. PGA Tour players are A-3 members of the PGA of America and they deserved a greater voice when it came to the Ryder Cup. That being said, I will always defend the PGA of America on its choice of past Ryder Cup Captains. However, Larry Nelson and Hale Irwin are certainly glaring omissions from several decades ago. GS: Have you gotten a thank you from the Task Force you helped start, post-2016 Ryder Cup? TB: Phil Mickelson left me a voice mail after Hazeltine and said, "I like the fact that you went out on a limb and brought the Task Force together even though you are not getting a lot of credit for that. It's a whole different feel than I have ever experienced before in my 20 years prior. l will never forget that first call I had from you about it. It's just one Ryder Cup, but we have something to build on now thanks to you." I appreciated that from Phil. GS: You dealt with Donald Trump quite a bit during your tenure as President and speak highly of the interactions you had with him. What should the USGA and PGA of America do, if anything, with regard to events hosted at his courses? I was disappointed when the PGA chose not to play the Grand Slam at Trump LA. TB: At the time, I thought that was a mistake. It has been surprising to me that more of the media are not asking the PGA questions about the 2017 Senior PGA at Trump D.C. and the PGA Championship at Trump Bedminster in 2022 given his past comments that are certainly degrading to women. As the guy who was exiled from the PGA for calling Poulter a 'lil girl, I have been surprised that the PGA has softened its stance on political correctness with Mr. Trump. But, like Mr. Trump, we have all done things or said things that we certainly would not want the public to know about. Trump has great courses and is a great host- so I say play on! Inevitable: Europe May Take Task Force Inspiration! As the timeline takes shape for Europe to select its next Ryder Cup captain--Paul McGinley says Christmastime for the Thomas Bjorn to likely get the job according to G.C. Digital--the 17-11 losers at Hazeltine may be taking inspiration from the vaunted American Task Force. Derek Lawrenson writes for the Daily Mail about Europe realizing it may not be fielding its best team, with Alex Noren serving as the latest reminder by winning his third European Tour title. Barring last-minute manoeuvrings, expect them to appoint Thomas Bjorn — and if anyone should know the time is right for change, it is the Dane. Bjorn benefited from the failings of the current qualifying system when he made the team at Gleneagles. He won the first qualifying event in Switzerland, then the Nedbank Challenge at the back end of 2013 - and was still hanging on to a place despite a single top-three finish over the next 10 months. He then struggled in Scotland, contributing a half-point. Yes, it is true the Americans putted far better than the Europeans at Hazeltine and that is why they won. But it is also true that players bang in form invariably do. --Match play is more interesting than stroke play. Particulary when we have so few matches and can focus on the dynamics of a match. Couple that with a team component and the Ryder Cup continues to be golf's most engaging, thrilling and fascinating event. Which is why most folks running the game wants to give us more stroke play. --This was another reminder that team match play must be contested in Tokyo 2020. As nice as the Olympic golf turned out, Rio's individual stroke play's dramatic ending paled in comparison to the Ryder Cup. --Experience does not necessarily matter. Darren Clarke's two experience picks were 1-6. Thomas Pieters, selected only because he forced the Captain's hand, was 4-1. Rookies on a squad that won 11 points were 7-9-1. American rookies Ryan Moore and Brooks Koepka earned five points for USA. --The PGA of America badly oversold the event, just as it did at Medinah. Throw in no cut-off for alcohol sales, leading to angry fans who couldn't see the already limited action. This led to terrible treatment of our guests and an embarrassing international narrative that required a (way too late) admonishment which helped matters Sunday. --No one should Tweet after 11 p.m. and a few consoling beverages. Especially when you've had a week like he had. --Course setup is not easy. But 18 center-cut holes? Strange. --Hazeltine's membership sacrificed their club and hosted to perfection. Every member encountered could not have been nicer or more welcoming. The members hit shots off of mats in August and closed the course on Labor Day so that Chris Tritabaugh could present conditions so good, no match would ever be impacted by faulty turf. Sadly for admirers of petty politicking and backstabbing the races look to have 1/5 favorites. Bust we mustn't give up hope. According to Golfweek's Alistair Tait, the oddsmakers will install Thomas Bjorn as the overwhelming favorite. A separate committee consisting of the three immediate past captains, a player from the tournament committee and the European Tour chief executive now decides who leads Europe’s Ryder Cup charge. That committee will lean heavily toward Bjorn. Clarke, Paul McGinley and Jose Maria Olazabal are the committee’s three immediate past captains. Bjorn, 45, served as a vice captain under all three. He’s also played on three winning teams (1997, 2002 and 2014), compiling a 3-4-2 record. I'll pause for a moment to let the goosebumps subside. As we know, the Europeans have had their share of captaincy drama and sought to stabilize the system. But a resounding 17-11 loss might just handicap Bjorn. Andrew Coltart makes a case for Ian Poulter, who will be 42 in 2018, to bring his unique blend of Ryder Cup passion and success to the proceedings. Poulter became a 2016 driver vice captain after a season-ending injury and successfully got through the week at Hazeltine without running over a spectator. On the U.S. side, Kevin Van Valkenburg at ESPN.com considers how Jim Furyk struck all of the right notes and it became clear that the next U.S.A. captain in Paris 2018 was at Hazeltine. Task force honcho Phil Mickelson was already plotting strategy for the captain, according to Love. In the post-match celebration, Love said while the win obviously meant a great deal to him, one of the things he was most proud of this year was developing (with Woods and Mickelson and other titans of American golf) an approach the U.S. can use going forward, for years to come. "We started this process well over a year and a half ago," Love said. "And we're sitting there on the 18th green watching the last few matches come in, and Phil is already explaining what's going to happen in Paris." Only the task force knows who will get to spend a lot of time in Paris, but in ESPN's four-ball, Bob Harig mentions this. Harig: If you go by how the task force laid out the plan for the future, it will be Furyk. He was a Presidents Cup assistant last year as well as an assistant at the Ryder Cup. You can expect him to be an assistant for Stricker at the Presidents Cup next year. Furyk has played on numerous U.S. teams. It sets him up to get the gig in France. Task Force, we are living in your world. Just let us know who you annoint the next captain. The Ryder Cup ratings news is mixed, with Golf Channel enjoying a historic day on Friday, while the weekend was down a bit since 2012 at Medinah. The reasons? It could be that these matches were without Tiger, with sooner ending and with millions of cords cut in the four years since the last domestic Cup. According to SBD, the 3.4 rating was down 17% from 2012's 4.1 rating. That puts the Ryder Cup behind the U.S. Open final round rating (3.8), and just barely ahead of The Open Championship among the big events. The Open aired much earlier in the day than the Ryder Cup. 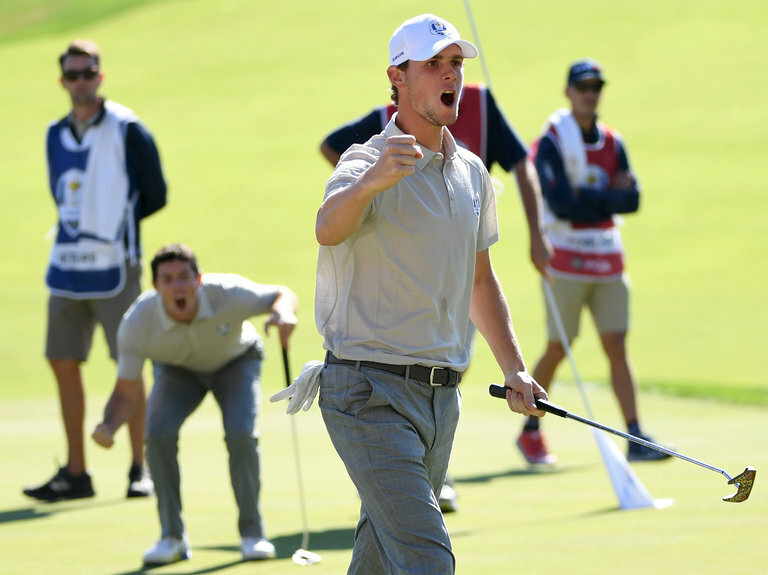 NBC Sports Group’s comprehensive coverage of the U.S. Team’s decisive 17-11 victory at the 2016 Ryder Cup concluded Sunday on NBC with 4.3 million average viewers and a 2.72 U.S. household rating (Noon-6 p.m. ET) according to Nielsen Fast Nationals. 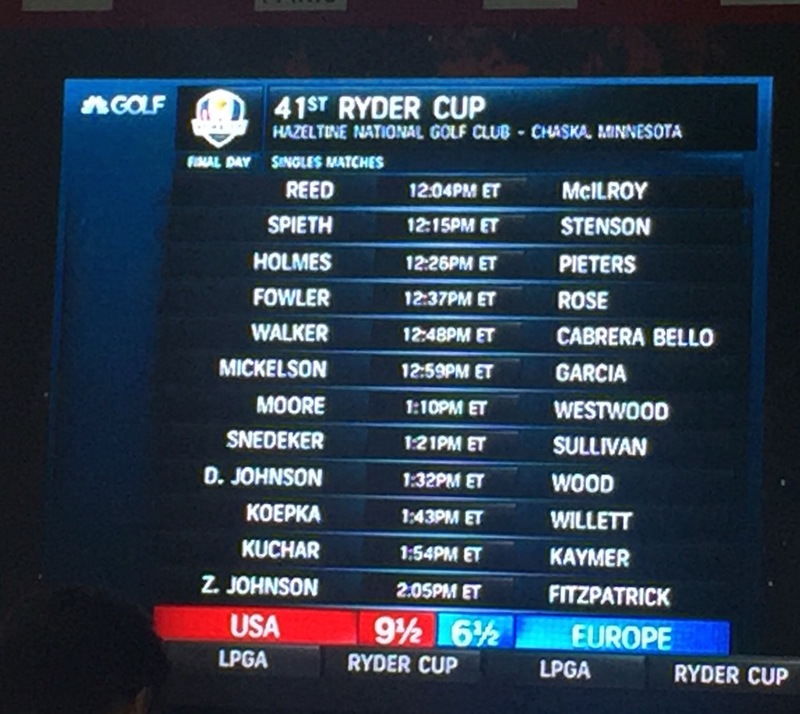 For average viewers, the 2016 Ryder Cup Sunday at Hazeltine National Golf Club outside Minneapolis was +95% vs. 2014 at Gleneagles in Scotland (7 a.m. – 12:40 p.m. ET); -22% vs. 2012 at Medinah outside Chicago (Noon-6:33 p.m. ET); and +2% vs. 2008 at Valhalla outside Louisville (12:30-6:07 p.m. ET), the last time the United States won the Ryder Cup. Viewership on Sunday peaked with 6.4 Million average viewers from 5-5:15 p.m. ET as Ryan Moore clinched the winning point in Match 7 of 12 at approximately 5:12 p.m. ET, 45 minutes before the conclusion of coverage. In comparison, 2012 at Medinah peaked between 6-6:15 p.m. ET as Europe’s Martin Kaymer capped one of the greatest comebacks in Ryder Cup history by winning the 11th match of 12 to win 14 ½ - 13 ½. · Across all three days, the 2016 Ryder Cup totaled 35.1 million live minutes, 487,000 unique devices, and an average minute audience of 22,000 across all digital platforms. The average minute audience of 22,000 users ranks as the highest for any NBC and Golf Channel event on record (NBC’s inaugural coverage of The Open had an average minute audience of 18,000). · Golf Channel’s Live From the Ryder Cup on Sunday evening following play posted a .31 overnight rating (6-9:15 p.m. ET), +121% vs. 2014 at Gleneagles and +82% vs. 2012 at Medinah. · On Friday with Day 1 of the Ryder Cup, Golf Channel posted its most-watched day in history, since the network was founded by Arnold Palmer more than 21 years ago, with 673,000 average viewers. Golf Channel was the No. 1 cable sports network by 319% in Total Day. --Team USA pulled more correct strings and used its depth to ultimately prevail handily. --Darren Clarke's strong views on experience backfired with the performances of Lee Westwood and Martin Kaymer. --Hazeltine National works very well as a Ryder Cup venue because it lent enough interest to the action and thanks to the amazing conditioning by Chris Tritabaugh's team, never in any way negatively impacted the matches. Kerry Haigh's ultra-safe Sunday holes looked more like a pro-am setup, but were probably almost too bland. Better to err that way than the other way around. --The Task Force. Our American heroes! The day has arrived and while Team USA's chances look promising for an early win, I think most of us selfishly would love to see this one draw out as long as possible. The players and their team squads have given us all we can ask for from an entertainment perspective, now we just need the fans to only be a story because they are just that loud, and all will be well. This week we’ve seen some of the largest and most exciting Ryder Cup crowds ever. Minnesota is home to some of the best sports fans in the country and we are so grateful for their enthusiastic support and warm hospitality. Rooted in the ideals of sportsmanship and international goodwill, the Ryder Cup is about having a spirited passion for not only the victory, but for the game of golf. We are encouraging all spectators on Sunday to be passionate and support their team in a way that is respectful to those around them, the players, and the Ryder Cup. Our security staff will continue to enforce a zero tolerance policy, removing from the course any fans who are disruptive in any way, including the use of vulgar or profane language directed at the players. We look forward to a strong finish today that reflects the spirit of the Ryder Cup and provides a positive experience for all. Alex Myers with the sign posting for fans to back up the statement. Kevin Casey with a roundup of the lowlights from Sergio and Rory. Bob Harig at ESPN.com is puzzled by the Rory McIlroy vitriol by fans. Captain Mickelson clutched up Friday and he sure does sounding like he's calling shots, Brian Wacker notes. 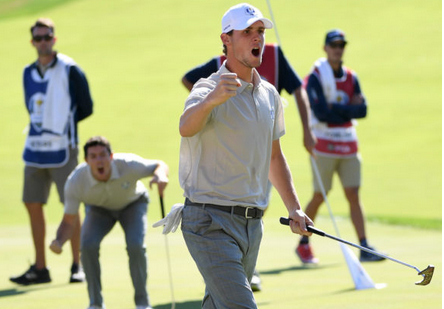 Karen Crouse says Thomas Pieters joins the likes of Nicolas Colsaerts, Philip Walton, Phillip Price and Ignacio Garrido in wreaking Ryder Cup havoc, and the Belgian also joins the tradition of another European connecting "effortlessly" with his teammates. Jaime Diaz sees the Europeans as looking a bit like the San Antonio Spurs. The matchups, which as I noted, Davis Love has had much experience with in situations like we see today. Do recall that Thomas Pieters was the third choice. Will A Few Fans Ruin The 2016 Ryder Cup Outcome? It was a glorious Saturday of Ryder Cup golf. All of the usual ingredients were in action to produce a day of drama unlike anything else in the sport. But the looming sense of an impending debacle can't be ignored. There is nothing wrong with rooting and cheering after a ball has been struck. Hope for your team. Hope for America! More embarrassing stuff. Drunk behind 12 tee won't let Stenson hit, even with Spieth waving at him. Stenson hits poor drive. Slams club. There were ejections Saturday according to NBC's Dan Hicks, but the mostly-nice people of Minnesota are in danger of having their Ryder Cup tainted by an incident that impacts the matches. The American players and their entourages, who have put themselves in position to win, could have the outcome tainted if the situation is not reigned in. Cutting off alcohol sales by noon tomorrow would help. The PGA of America undoubtedly has weighed the risk-reward elements, and plans to go for the green no matter how discouraging the signs. A few Tweets from Sunday, including this from Christine Brennan who filed this story with Martin Rogers about the Rory McIlroy incident. A video of the incident as well.